“Oh heavens no,” says Loter. Stuffed frogs fill the shelving and assorted cabinetry of Charlotte Loter’s Polk City townhome. After that first frog from her mom, there wasn’t another for years. Then she received one from her aunt. But even then, her frog collection didn’t amount to much. “About 25 years ago, it just blew up,” she remembers. While on vacation in Florida, Loter discovered a replica frog museum. She made frog-hunting friends and started to learn all the frog ins-and-outs from others. Frog hunting has been her passion ever since. She has obtained frogs while in Germany, Cancun, Florida, Hawaii and innumerable other destinations. These amphibians are constructed from nearly every substance you can think of, fabric, ceramic, glass, tin, steel and so on. How many frogs populate Loter’s collection? “More than 3,000,” she says. Not counting articles of clothing. She has stuffed frogs. Ceramic frogs. Frog bells. Jeweled frogs. Shirts adorned with frogs. Figurine frogs. And of course, Kermit the Frog. In fact, her most valuable piece is a Kermit cookie jar estimated to be worth around $400. Kermit sits up high on shelving that she had specially built for her set of amphibians when she bought her new townhouse. The shelves take up much of the basement wall space, serving as eye-pleasing entertainment and unending conversation pieces. They also allow her to showcase hundreds of frogs at once. The frogs that don’t fit on the shelves are throughout the rest of Loter’s home, but many that don’t have a featured post are stuffed under the pool table. Loter has a hunch that she has the largest collection of this kind anywhere in the state. She often buys them from garage sales, flea markets and eBay. But her friends and family have also served as a primary source for her collection by keeping an eye out for her and offering unique finds as gifts. Surprisingly, she says she will occasionally eat frog legs, but don’t tell her collector friends. The two live frogs she maintains as pets, Buddy and New Frog, might not appreciate that information, either. No Atari Frogger games are in Loter’s collection, but just about every other pop culture frog icon is represented. Budweiser frogs. Neil the Frog. Tillie the Bag Lady Frog and Hillbilly Frog. In case you are wondering, she will occasionally kiss one of her frogs. But just for fun, and not because she is searching for a prince. She already had one of those. Her husband, Robert, and fellow frogger recently passed away. The duo had lived in a multitudeof locations including three years in Germany, but Polk City has been home since 1996. 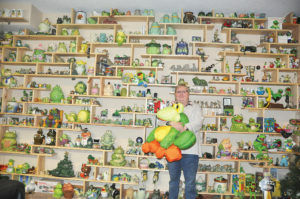 Also in her collection, Loter has frog table settings, frog pitchers, frog teapots, and frogs as far as the eye can see. The front door of her home is painted green, but she says it isn’t due to her amphibian passion; it is only a coincidence. “But I guess it is appropriate,” she laughs. Thanks for article Jeff. Only I was on vacation in Arkansas.